This project here has been growing for long time really. It's taken quite a while to gather a good load of models and it's taken another good while to get started on them. I wouldn't have got round to them actually if it wasn't for an offer I simply couldn't refuse/resist. You'll know a bit more about it but let's get back to our main topic here. 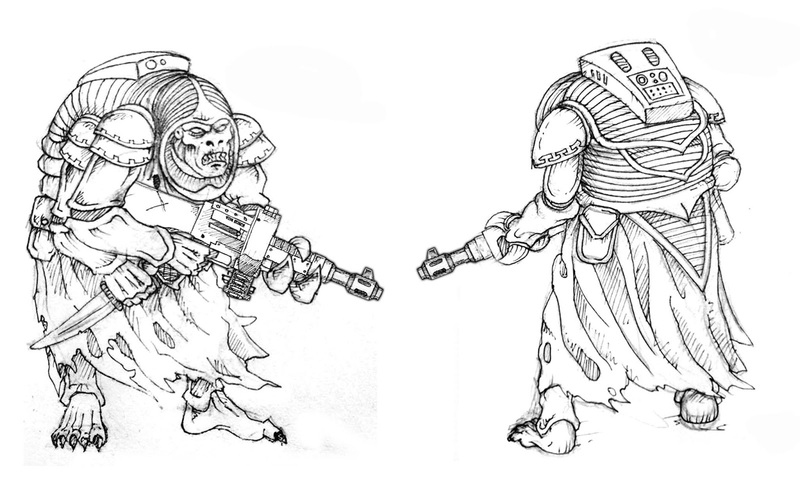 Go back a couple of years back and I got lucky enough to take part in a private commission project that saw the release of a few Genestealer hybrids that filled a few gaps in the blank space GW had forgotten in the old days. Those were mostly sculpted by no other than Bob Olley. I think about 50 sets were made at the time so if you're looking for those... well... I advise you to just fall back to the good old ones or the new excellent ones released in Overkill. The most impressive model of the group is without a doubt the ogryn hybrid. Just feel the weight of it in your head and you can sense how leathal it is (literally). The ribbed hood, bent back and 3 arms suggest a early generation and the ripper gun says ogryn right away. A perfect interpretation of a brilliant concept. The other one is obviously a magus and a female one on top of that. I think that the idea of adding a genestealer familiar adds a very creepy feeling to this model, like adding motherly tenderness to some weird alien hybrids makes it even more disturbing. The third model sculpted by Bob for this project was the Hierarch. 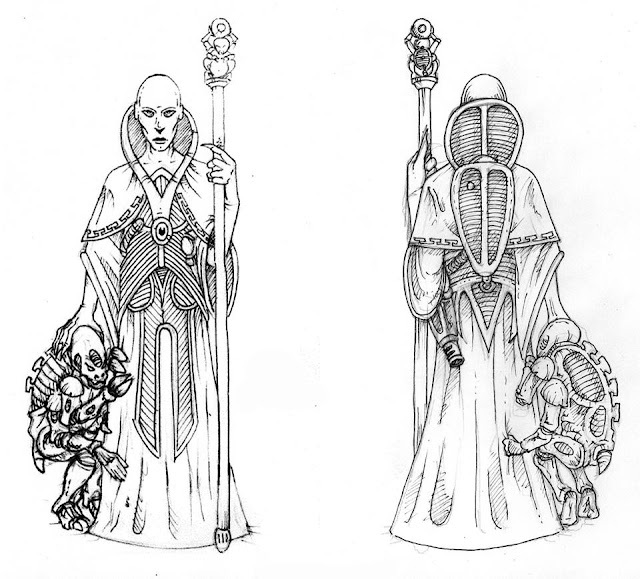 The hierarch is maybe not as iconic as a magus or patriarch can be because the concept only appeared later on in the Citadel journal (issue 40, see below). The Hierarch is essentially a non pyshcic 4th generation hybrid champion who takes care of the dirty stuff. Once again, the little details like the very Dunesque outfit and the servo-hybrid skull are just too good. Painting wise, I made a very strong choice at the start of this group. The kind you're both very happy and yet slightly worried about all along. The traditionnal blue and purple scheme was a complete no go for me from the start. I really wanted to have a striking coherent scheme for this group though. For some time I had considered painting my space skaven in orange and black because I loved this combo but I eventually ended up painting them more like scavengers. The orange parts also looked good (in my head) for stealers as they enhance the insectoid look. Well of course, that didn't quite happen like that but it's actually not that bad since I had to alter a few things with the hybrids (mostly to differentiate the chitin from fabric and other things like that. this would have forced me to get back to the stealers which I really don't like to do. So now we're set with a colour scheme and I believe it will work even better with time and number. Absolutely gorgeous! It's such an eye-catching and unusual colour scheme, but it works! I like the little details you've painted - the dirt-spattered robes, the red rimmed eyes. The ogryn hybrid is my favourite (of course)! My only comment is that the familiar gets a little lost against the magus' robe. I don't know how you solve that though. Can't wait to see what you have coming up! Cheers, I was scared the whole time the colour scheme wasn't right to be honest (still am a bit). You're right about the familiar, I've changed its tone from teh fabric next to it but I should blackline carefully arond just to break them apart visually. I could have painted the robe in a cream colour too to give her another role than just being a magus. Man they are beautiful. I've reawakened my own cult now, but I'm doing the traditional blue and purple scheme... I just like it. As you say they new Deathkill Overwatch (or what the heck the game is called) are fabulous. I got a fair few of the old ones as well, awaiting new arms. I've built about a dozen of the new ones and they are very nice, great details and all. I need to paint some purestrains first though ! 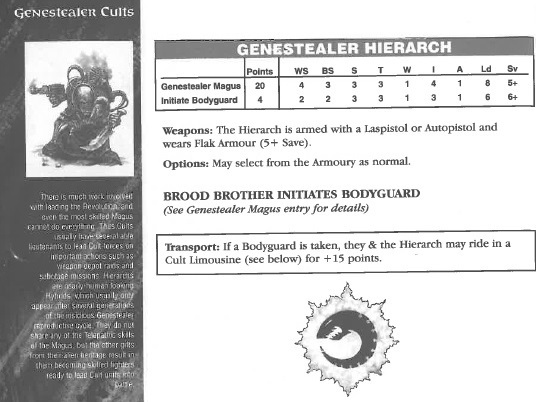 It's interesting that they have dug up the concept of the Hierarch in the new Primus model. GW have been very good at repuporsing old ideas for many years now, it's a double win really, people like it and it takes them less time than to create purely new stuff. Wow, man, these are terrific. I love the way they look. I got the new Overkill stuff and my plan was using quite a similar scheme, so your work will be a source of inspiration! Eager to see what you come up with amigo, with your insane speed you'll have an army before I have a warband ! Outstanding! You've really nailed that colour scheme JB; I love the orange. Such the master of grey and black, although I know you always play that down. 😉 And beautiful work from Bob too. Tremendous work JB, it's really great to see these guys getting such love. I really like the scheme on the familiar(though in my mind they'll always be infant purestrains), the dark flesh does help lift it out and define it from the magus' robes. The ogryn is my favourite of the group as well, I love seeing him painted. Bravo sir! Jb these are saweet! The orange is stunning! Excellent use of non traditional color scheme. Cheers bud, glad you like them ! I'm a big fan of the old purple and blue, but these look top notch. Well done. Have they seen action on the tabletop yet? One of them falling on the tabletop of my painting desk is the best action they've had so far. I'm having a gaming WE in about 2 weeks though so I'm not desperate to see them sweat a little. 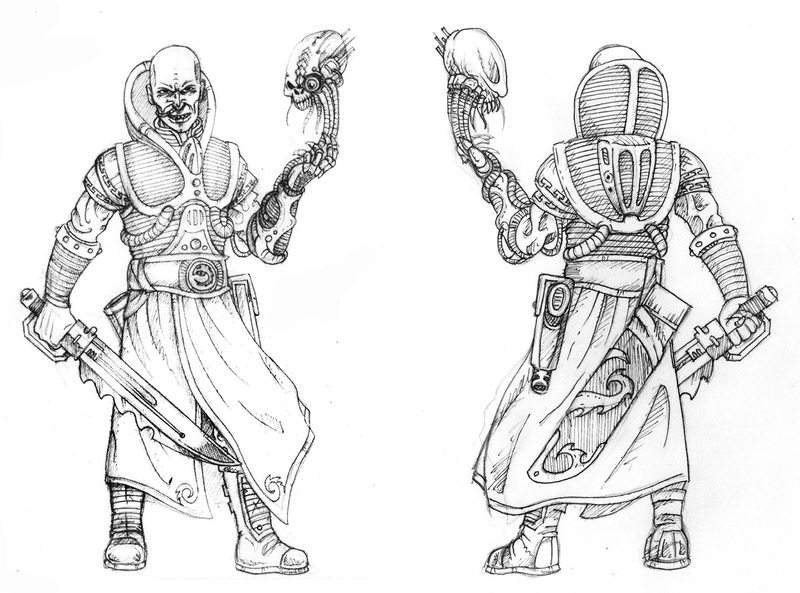 looks like the Genestealer cult gets lots of attention nowadays. I never saw those models before and I have to admint my preference for the female magus both because it's a female (which is quite rare in the dark future) but also because of the familiar which happens to convey both an horrid and sweet feeling. Your orange is perfect next to grey/black and suits them very well. Well done ! Cheers, 50 sets means it was easy never to come across them really. Glad you like the colour scheme ! At the first look I was doubtful about the paint scheme with orange pattern (I'm a fanatic follower of the original eavy metal paint scheme, in fact I copied it in my cult), but after few seconds I liked it, especially thanks to your excellent paint skill. I especially like the hybrid faces, familiar body and ogryn hybrid arms. I think that the orange paint scheme will be fine for the genestealers. Very nice indeed! Everyone loves a genestealer cult; looking forward to seeing what you come up with next! Well, there's some unexpected stuff for sure ! That orange is a wonderful colour and beautifully painted. My only suggestion is that the hybrid familiar, being the same colour as the robe of the magus, gets a little lost. Otherwise I absolutely love 'em! Nice work on the orange. Different, but it really works. They're all great figures too. Looking forward to seeing the ones you're teasing us with! You could perhaps work a more neutral colours into the middle areas of the familiars carapace JB, as if the exoskeleton is softer or in the process of being shed or regrown. As well as being a potentially desirable neutral colour in the palette that gives you precedent/options down the road, it would also mean that you don't have to alter the planned scheme on the purestrains. I'll look into that, I had already altered the colour but photos reveal what the eye won't see and now the lack of contrast is striking. Lovely work! Orange is one of those colours you don't see enough on the battlefields of the future (or the past) and you did a very good job making it look both bright and dirty. Cheers, at least I know they'll be easily identifiable ! Cracking figs and perfect colour choices! Man these should be out there to buy! I'd love to paint them! Unfortunately they're not but I've been told you can expect new ones of the sort in a not too distant future. I live in the void already ! Wow these are a bit special - would love to add them to my cult at some point but sounds like that may be tricky! Nothing wrong with blue and purple really, I'm just a contradictive bugger ! Have you seen the malignancy models by macrocosm? They came out a bit before overkill and have a more rogue trader feel to them. Those overkill models are really nice though. Yes I have and I've had some in hand. They're pretty cool models indeed, definitely a good way to make an army of hybrids. Merci mon cher, c'est vrai que les concepts sont très bien pensés et le bebe genestealer ajoute une bonne dose de lugubre.